Hello, my name is Layla Saad. And I built a white feminist temple. That is to say that my business, Wild Mystic Woman, which I have always described as a ‘temple space for wild women & modern mystics’, was in fact a temple space that was predominantly for white wild women, and white modern mystics. I have always used predominantly black women’s imagery in my branding. I have never stated that my work was predominantly for white women. And yet the truth that I have had to face is that my beautiful business has always catered to and served white women, 95% of the time. This temple that I have so lovingly built, brick by brick, is a white women’s temple. It does not matter that I, a black woman, have been the high priestess of this space, because the majority of members in this space have always been white; making me and women who look like me a minority. White women did not marginalise me and women like me in this temple space. I did exactly what I have been asking white women to stop doing to us. I have been perpetuating white supremacy through my business, because of my own unexamined internalised racism and conditioned oppression. None of this was by intentional design. It was by unintentional default. The unintentional default in most online businesses (regardless of who runs those businesses) is that whiteness is centered. White imagery, white clients, white perspectives and white narratives of success, empowerment and spirituality dominate this industry. This is because this industry reflects the white supremacy ideology that white is seen as ‘universal’ and applying to all, and non-white is seen as ‘other’ and applying only to those who are non-white. It is only when a business owner makes the intentional and overt choice to purposely de-center whiteness and center people of colour that things begin to shift. So while I have been growing this business, it has not mattered that I am a black woman. It has not mattered that I always used predominantly black women’s imagery in my branding. It has not mattered that I never stated that my work was predominantly for white women. None of these things mattered, because I did not intentionally de-center whiteness, and consciously center people of colour. I made the unconscious assumption that having a business that was open to all women would mean that I would see a diversity of women as my clients and readers. That me being a black woman was enough to create a business that was diverse and reflective of my racial identity. This was not the case, and it is why I have built a white feminist temple, and why I'm ready to tear it down. For the last few weeks I have been offline, taking a winter break from social media and my business. Following the viral impact of my work since publishing my letters on ‘I need to talk to spiritual white women about white supremacy’, I have been on a rollercoaster of a ride of hyper visibility and business growth. However, the biggest impact for me personally of this whole journey has been the learning and unlearning I have been experiencing as a black woman. Prior to publishing those letters, I did not talk about race in my work. So while I was aware of racism as a black person generally, it wasn’t something that I thought about everyday or clearly saw in the circles that I worked and played in. And while I spent a lot of time thinking and writing about my transformational journey as a woman, I spent hardly any time at all thinking and writing about my transformational journey as a black woman. However the huge reach of those articles suddenly exposed me to dynamics and behaviours that have been right under my nose all of this time, that I’d never really noticed were commonplace in the white-centered online business world. Things like tone-policing, micro-aggressions, spiritual bypassing, white fragility, constant requests for emotional labour, claims of being colour blind, cultural appropriation, the perceived invisibility of leaders and teachers of colour, misogynoir, internalised oppression and so much more. Amongst the chaos (both positive and negative) that was generated by me talking more and more about race, I began to see myself as a woman who is black. And I began to think about what what it means to be a black woman in spaces that are mostly white centered. Not just ‘out there’ on Facebook and Instagram, but inside my own business. Inside my business temple that I had assumed would center women like me, but was in reality centering white women. A terrifying dynamic that I began to notice, was that my sudden popularity as a writer was happening because I was specifically speaking to white people. And although my recent work has been in no way comfortable for white people or coddling of whiteness, my sudden popularity as a writer has come because my work has specifically centered whiteness. I did not write an essay called ‘I need to speak to women of colour…’ I wrote an essay called ‘I need to speak to white women...'. Thus in effect, making white women my primary audience and de-centering women of colour. I was no longer centering whiteness by unintentional default anymore, but by unintentional design. Is it any wonder then that the majority of people who are currently supporting me on Patreon are white? That I am receiving PayPal donations from white people for my emotional labour in talking to them about white supremacy? Don't misunderstand me, I am beyond grateful for the financial support for my work. However, because of this dynamic of me speaking to white people about white supremacy, and white people paying me for it, it feels like I am being paid to do anti-racist education work. But here’s the thing: I’m not an anti-racist educator. Or an activist on the front line. Or a social justice worker. Or an anti-oppression teacher. I am a black woman who is a writer. I write personal essays and poems, with a liberatory consciousness lense about spirituality, leadership, business and social justice. My purpose is not to hand hold white people to teach them about white supremacy and what they need to do dismantle it. And the fact that I have believed that this is my purpose for the last few months is indicative of the fact that I have been centering whiteness all along. It is only in the last few weeks where I have been offline, away from the thoughts and narratives of white people on social media, that I have had the chance to truly to connect to myself and hear what wants to come forth from me. I have realised that by constantly writing and talking to white people, I have completely ignored and de-centered the woman of colour’s gaze. I have done to women of colour what white people do to us all the time. And that makes me sick to my stomach. During my winter break, I have been immersing myself in books, articles, videos and podcasts by and about black feminist writers and thinkers. I have been saturating myself in resources that unapologetically center the black gaze, not the white gaze. I have been moving my way through the stages of black racial identity development that William E. Cross Jr called the Nigrescence Model. Who am I as a writer, and what do I want to write about when I take away the white gaze? What would the spirituality/personal growth/wellness industry look like if it was an industry that centered the voices, bodies, narratives and perspectives of black people and people of colour? What kind of topics would prominent black writers like Audre Lorde, bell hooks, James Baldwin and more have had the chance to write about, if they didn’t have to spend so much time writing about white supremacy? What other great works might they have had the chance to create if they hadn’t had to spend so much time defending their humanity as black people, while at the same time, educating white people about racism? What more magic might they have brought to the world if they weren’t living under a system of oppression? These are the questions I have been sitting with, as I reflect on how my sudden growth has primarily come about because of the white gaze. What happens to my writerly imagination when I am at some level always conscious of representing my race to, or in spite of, a race of readers that understands itself to be ‘universal’ or race-free? And what of myself do I lose from that? What of myself am I having to sacrifice and compromise so that I can keep this growth up? What part of my purpose and my identity becomes buried when I cater to whiteness? And how much sovereignty and agency do I really have if my success is in the hands of whiteness? Is this is the kind of freedom and success that I want for myself as a black woman, and is it the kind of freedom that I want to be advocating for other black women and women of colour to have? This is me participating in, enabling, creating and allowing my own oppression. My own enslavement. My own denigration. My own erasure. This is me perpetuating white supremacy through my own work. I am a black woman, who has built a white feminist temple. And now I’m ready to tear it down. In order to tear it down, I need to know exactly what the foundational pillars are that I used to create it, and the foundational pillars that I want to replace it with as I rebuild it. 1. Catering to and centering the white woman’s gaze. Because I have not consciously de-centered the white gaze until now, the default has been that my work has always been through the white gaze by default. This is why the majority of my clients and readers have been white. This is why I felt the need to write ‘I need to talk to spiritual white women about white supremacy’. This is why I have spent so much time and energy over the last few months talking about social justice with white people. And this is why, as a black woman, I have felt that I have become a resource for white people for them to learn about anti-racism. Why I was starting to feel like my work would not be relevant if I chose to speak about other things outside of race and social justice. Ever since I started working for myself three years ago, 95% of the programs I have bought, courses I have been in, coaches I have worked with and teachers I have learnt from have been white. Is it any wonder that I myself have a white perspective and a white gaze? And going back further than that, my growing up in a western country meant that I was conditioned by society to believe that white was right. That white was the standard to aim for. That as a little black girl, I needed to work twice as hard to get half as far as a white person. That white validation, whether at school or in business was necessary to feel worthy and to experience success. 2. Stories and myths of liberation from oppression and reclaiming sovereignty that are from the white woman’s perspective. I spent much of 2016 experiencing a spiritual awakening that led to the creation of Wild Mystic Woman. During those months I read spiritual book after spiritual book, as I explored my own mysticism and identity as a woman. I did not realise the significance of this at the time, but nearly all of the books that I read during that period were authored by white women. Books like The Heroine’s Journey by Maureen Murdock, Love Your Lady Landscape by Lisa Lister, Burning Woman by Lucy H Pearce, The Dance of the Dissident Daughter by Sue Monk Kidd and many, many more. Because I was still not awake to what it meant to be a black woman, I did not notice that the narratives of oppression and reclamation were from a white perspective. I did not notice that the daily spiritual nutrition that I was taking in was that of white women’s perspectives, almost exclusively. And that the stories and myths from these books centered on liberation from the patriarchy. The struggles that these books outlined were centered on gender, not on race. So the education that I was receiving around my own empowerment was incomplete. These books were not wrong or bad. But they were only a part of the picture, and in some instances, they were part of a picture that wasn’t even mine. These books only helped me to look at one part of me - my gender identity - and completely ignored my racial identity. Because white women’s liberation from oppression has not been about their race. They have never had to struggle under oppression because of their white race. Their struggle has always been about their gender. For black women and women of colour, it is about both. Black women do not only have to worry about sexism. We also have to worry about racism. I am not faulting these authors for not writing about race. As white women, they cannot write about the spiritual and transformational journey of a black woman from a place of true experience. But what I am angry about is that those books that I want and need to read are not easily found. They are not best-sellers. They are too few and far between, and they are completely obscured by the dominance of white narratives and white stories of spiritual growth, resulting in black women like myself having to really search to find the kind of books that we want to read. While white women’s books about the witch wound and liberation from patriarchy are generally seen as spiritual books, women of colours books about the race wound and liberation from white supremacy are generally seen as political books. Where then, does a black woman go, if she wants to read about her liberation from oppression within a spiritual context? 3. Spiritual practices that are culturally appropriative. New age white spirituality is highly culturally appropriative. As someone who was very much influenced by these narratives, I now find myself with sticks of palo santo and white sage bundles in my drawers. Why do I need these sacred Native American plants, when I come from and live in cultures (African and Arab) that have their own spiritual tools? I do not need white sage. I have bukhoor or Arabic frankincence, that my family has used daily all of my life for the same purpose that white sage is used for. It is the white gaze and the white perspective that I held which made me believe that I had to look outside of my own culture to find spiritual tools. New age white spirituality and white-centered goddess spirituality colonizes the spirituality of marginalised people. The more I become aware of this, the more angry it makes me every time I see white spiritual mentors and teachers talking about Hindu goddesses, the chakra system, Native American shamanism, etc as if these traditions are their own. Many of these people belong to the ‘spiritual but not religious’ crew, while casually appropriating from religions that they feel are ‘exotic’ or more interesting than their own. I am angry at myself for the times I have spoken about the Hindu goddess Kali or the Buddhist goddess Kuan Yin - religions that I do not belong to - without the respect and reverence for the religious traditions that they belong to. White woman spirituality taught me that. 4. Serving mainly white people through my work. As I’ve mentioned before, the majority of my clients and readers have been white, because I have not intentionally and overtly stated that I desire intersectionality and diversity. This needs to change. In essence, these four pillars helped me to create a mainstream, white feminist space. 1. 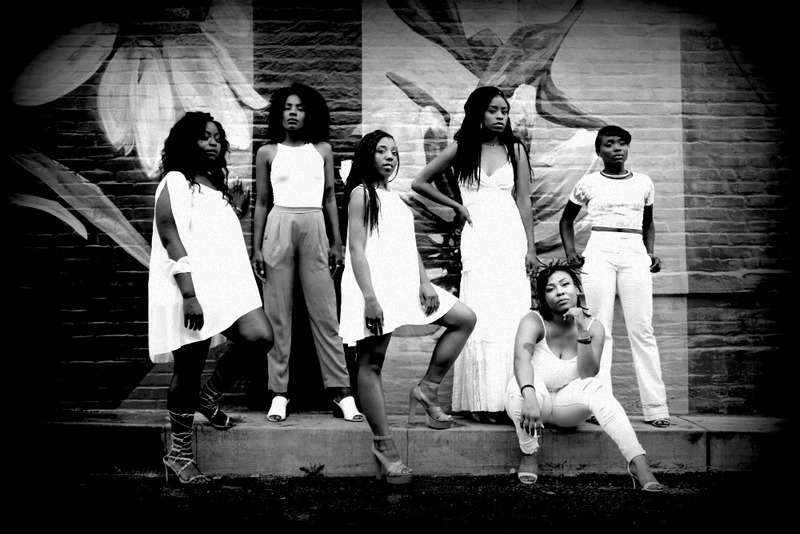 Catering to and centering the black woman’s and woman of color’s gaze. This does not mean that white people are not welcome to read my work or will not find benefit from my work. What it does mean however, is that I will not cater my writing or focus my work on the white gaze. The gaze will be my own. I will write for myself, as a black woman, and to black women and women of color. And any benefit or inspiration that white people gain from my work will be a side-effect or unintended consequence. This is the complete opposite of ‘I need to speak to spiritual white women about white supremacy’. Quite frankly, I’m done speaking to white people about a problem that I did not create and do not benefit from. And if I do choose to speak on these subjects in the future, it will be on my own terms and not because I feel a responsibility to do so. I want to focus my writing and my work on what I want to see as a black woman. 2. Stories and myths of liberation from oppression and reclaiming sovereignty that are from the black woman and woman of color’s perspective. White woman stories and myths of liberation focus on gender. I want to focus on what bell hooks calls ‘white supremacist capitalist patriarchy’. And as I mentioned in the first pillar, this will be from a black woman’s gaze, not a white gaze. My race is just as important to me as my gender identity. As the Malawian poet Upile Chisala has written, I am Black and Woman. 3. Spiritual practices that are from my own ancestry, and hypervigilance of appropriating religious and spiritual traditions of other groups - especially those who are marginalized and oppressed. I will continue to my spiritual explorations as a wild mystic woman. However, instead of picking and borrowing from other people’s cultures, I will look more closely at my own. I will delve back into my ancestry and cultural traditions as a woman of African and Middle Eastern ethnicity. I can appreciate the spiritual traditions of other cultures, without appropriating them. I will stop perpetuating the methods of the white coloniser when it comes to my spirituality. 4. Serving mainly black people and people of colour through my work. My writing and future programs will be specifically catered to serving black people and people of colour. In essence, these four pillars will help me to create a black feminist and womanist space. White people who have followed my work, I am grateful for you and the way you have supported my work. However, I cannot continue to center and cater to you. When I think about just how much work needs to be done (and how much work has already been done for centuries) on dismantling white supremacy I feel exhausted, pessimistic and completely disheartened. I think about all the tone-policing I experience. The accusations I receive of being ‘too angry’ or ‘shaming’ even when I take the time and care to write with truthful compassion. The gut-wrenching times when a white person allows harm to be done to myself and other women of colour in their presence. The emotional labour and time I put into helping a white person understand why their post is perpetuating oppression, only to have them delete everything I and others have wrote. The need to take screenshots and have ‘receipts’ when interacting with white people who are being problematic. The amount of harm a white person has to do to me and other people of colour before they finally ‘get it’. The gaslighting and spiritual bypassing. And on, and on, and on. I want a new world, as much as you do. But I cannot continue to sacrifice myself to whiteness in order to help create that world. What I can do however, is start to live as if that world already exists. To live that world - a world in which black women and women of colour are safe, valued, seen, celebrated, supported and respected - right now, through my business temple. To act as if that world already exists or the seeds of that world are being sown, in the way that I write and guide others. To bring hope now, through the way that I fully show up as a black woman, and fully show up for black women and women of colour. This is not what I think all black people and people of colour should be doing. But it is what I want to do - for myself and for any black woman or woman of colour who I am here to serve. Because I need hope. And we deserve to exist and thrive outside of just talking about our racial oppression. We are not just a group that has been marginalised and under-privileged. We are brilliant. We are smart. We are creative. We are funny. We are beautiful. We are ordinary. And we are magic. And we deserve to have spaces and stories that center us in ways that are celebratory. This industry, and the white-centered spaces that we often work and play in would, as Toni Morrison has said in her interview with Charlie Rose in 1998, have us believe that "...Our lives have no meaning and no depth without the White gaze". My decision to tear down this white feminist temple, and build a black feminist and womanist temple in its place, is my act of radical resistance and my act of sacred activism. I may not be able to dismantle white supremacy. But I can create a space where the values and dynamics of white supremacy are not entertained. Where whiteness is not a thing that I or other women of colour have to be constantly wrestling with in ways that are demeaning and disempowering. Where we are not only safe, but we are also honoured. Where we can be ourselves, unapologetically. So to my white readers, while you may no longer get the direct benefit from me of having my work catered specifically to you, what you will indirectly receive is a view into a world where black women and women of colour are upheld and elevated. Part of relinquishing your white privilege and building the new world beyond oppression, is accepting that your white gaze must be de-centered, so that more of us can have the chance to be seen and heard. And if you are a white person who is truly dedicated to the dismantling of systems of oppression, then this work and the work of all black women and women of colour (regardless of whether or not we are anti-racist educators or anti-oppression teachers) is worth supporting and uplifting. Even if it's not for you. Especially because it's not for you.